Are you looking for a bilingual DropShipping Agreement template in Chinese and English language? Download here your solution, a Chinese-English Drop Shipping Agreement Template if you want to drop ship goods directly from China to your customers worldwide! As you may know, Chinese language is always prevailing in China, so if you work with a contract, make sure the Chinese text is correctly representing your needs. Our trustworthy legal templates are all crafted and screened by bilingual (Chinese and English) legal professionals. This drop shipping agreement with Chinese factory template covers the important subjects and will help you to structure and communicate in a professional way with your Chinese supplier. Also called Direct Shipping, is a supply chain management technique in which the Vendor transfers an Order and shipment details to either the [Chinese] Supplier or a [Chinese] Wholesaler, who then ships the goods directly to the end Customer. The 3 step process virtually guarantees you can finish and print your legal document in minutes! 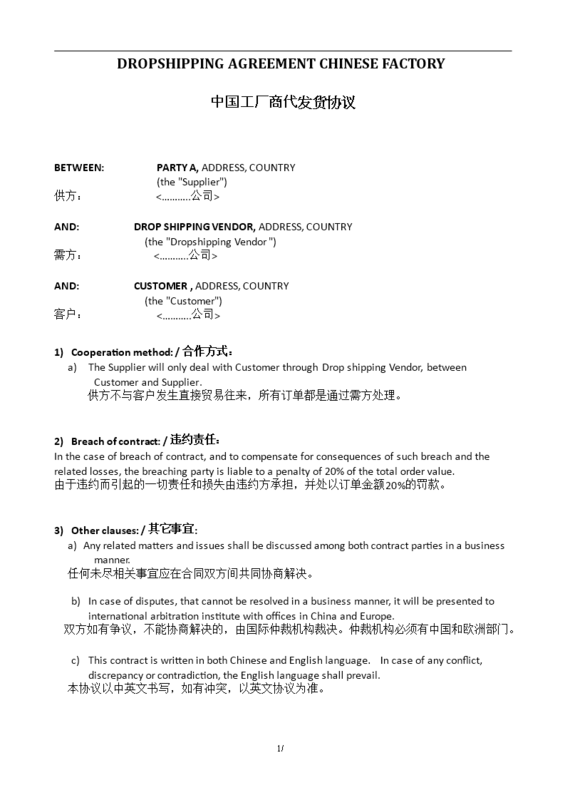 Download this legal Chinese dropshipping agreement template, fill-In the blanks, print ...done!